The holiday season is the time when families bundle up, pile into their cars and drive around taking in all the glimmering holiday lights. 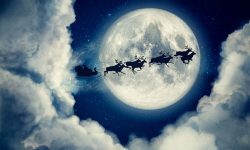 But don’t forget: While onlookers are cruising through your neighborhood, they’re not just marveling at the animatronic reindeer — they’re also sizing up your curb appeal. After all, it’s impossible for them to “Ooh!” and “Aah!” at all the shining bulbs without first noticing how your home looks from the outside. Not to mention the guests most people entertain throughout the season, all those eyes forming their first impression of the place you call home. Whether you’re trying to woo prospective buyers or impress your mother-in-law, it’s essential during Christmastime to keep your house looking its best. 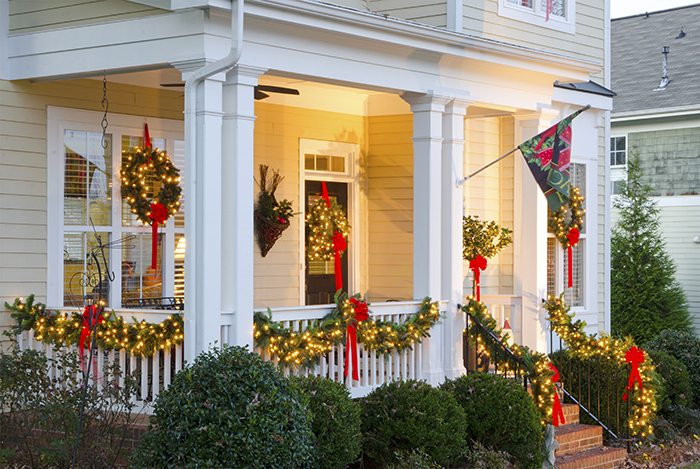 Luckily, with all the decor opportunities that go hand-in-hand with the holiday season, it’s easier than ever to keep the exterior of your home in tip-top shape. Here’s how to give your home a facelift for the festivities — without cutting into your gift budget. First thing’s first: the basics. No matter how many lights, wreaths, garlands, or other cute Christmas knick-knacks you slap on your house, it won’t disguise a failing facade. 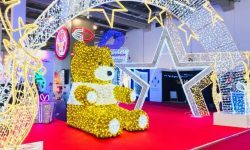 In fact, overloading your home with eye-catching decorations can actively draw attention to those aspects you’d rather keep hidden if you’re not careful. So before you start going full Clark Griswold, you should ensure you have all the fundamentals down pat. If you live in a climate that still offers warm and dry days this time of year, take a long, hard look at your home’s paint job. Are chips flaking off in the corners? Have the vivid colors faded to a washed-out pallor? If so, the single best thing you can do is get out the paint cans and get to work. People tend to assume that do-it-yourself house painting is an expensive, laborious process, but in reality, with a dedicated effort you can be shucking off your crusty painting jeans in just 2-3 days. If you’re too time-strapped even for that, consider just touching up your siding, or brighten up your front door. Most exterior paint will only run you around $30 a gallon, and if done right, is a weekend project that gives results you can enjoy for a decade or more. Even if you’re not ready to paint your home, you should still give the exterior a thorough cleaning. Pick up a simple siding cleaning kit from your local hardware store for cheap. These can attach straight to your hose, brush and all, and supply your stream of garden hose water with cleanser for those tough-to-scrub areas. If you want to get serious, rent a power washer for a day and really cut into those dirt stains. Turn it onto the sidewalk and feel the satisfaction of obliterating those blotchy little spots that have stubbornly sat on the pavement for as long as you can remember. After rinsing everything down, you’ll be amazed how much newer your home will look. Now get festive with it. Christmas decorations can be as simple or as elaborate as you want them to be, but oftentimes, when it comes to curb appeal, less is more. If you’re wanting to keep it tight and tasteful, start with your front porch. Grab a few garlands and wrap them around your porch posts, and along the balustrade. Hang a simple wreath with a nice bow that compliments the color scheme on your front door. Even something as basic as a holiday welcome mat can go a long way in creating an impression for visitors. To make your porch really pop from all the way out on the street, it’s best to do a mix of textures, shapes, and complimentary colors. Whenever you add a new decoration, go out to the sidewalk and see if it fits. You need to be ruthless; You may love that antique sleigh, but does it really go with those oversized bulb ornaments? 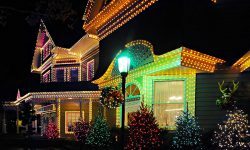 Before you get up on the roof and start putting up the Christmas lights, examine your fixtures. A lot of people like to go with alternating red and green light bulbs for their garage and porch lights, but in the wrong hands, these can create a dark, uninviting walkway. They can work, but whatever you do, make sure it all matches, and that it genuinely looks good, rather than just Christmasy. Now, if you’re up to it, it’s time to put up the holiday lights. 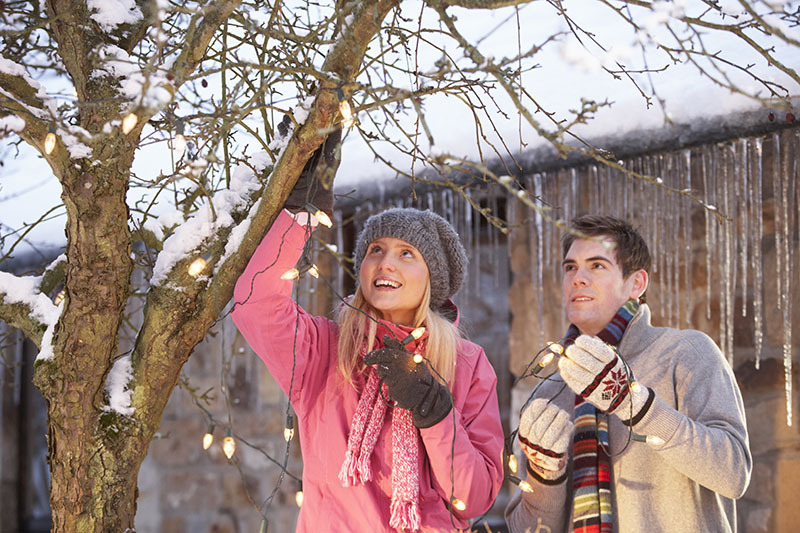 Use our handy guide to hanging Christmas lights here to learn everything you need to know about this sometimes daunting task, and to ensure you smile, rather than frown in frustration, when the job’s done. The key is to take your time, and avoid cutting corners whenever possible. 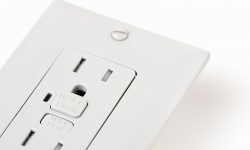 When those lights switch on and blast out into the street, any section where something is hanging down or improperly spaced will be glaringly obvious. 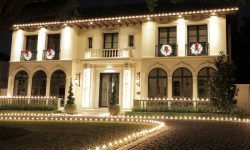 To make your lights really pop, you don’t have to go crazy — a few high-quality, well-placed strands will always beat out a haphazard overload of blinding colors. Though, of course, if you’re more of an enthusiast, go all-out! Just keep these basics in mind. Once everything’s clean, your front door is looking Santa-ready, and your lights are finally all in place, you’re all set to coast into the holiday season looking like the most festive folks in town. Hook up your lights to a timer, and set it to turn on just before the sun sets. It’s an insider secret; Most people turn them on after it gets dark, but lighting them up in the “golden hour” can give your home a warm, welcome glow. Now that your work is done, sit back and enjoy your fresh-faced home, knowing that even your snootiest relatives will change their tune. Just make sure not to rest on your laurels for too long. After all, there’s shopping to do!